Is Cleveland’s League Park the Oldest Ballpark in North America? League Park, Cleveland’s legendary ballpark that quietly resides on E. 66th and Lexington Ave., is pretty old, but is it the oldest existing ballpark in North America? The answer is yes, and no. In order to answer the question, a thorough defininition of the categories by which you will apply the term “oldest” will need to be addressed. There are differences between ball grounds and ballparks; professional ball fields and amateur fields; Canadian parks and United States parks; and what’s being used either “continuously”, or as a ballpark today. In other words, the large amount of categories makes it hard to nail down which is the oldest “ballpark”. 1. League Park was a baseball ground from 1891 to 1946, and is presently being used as a ball grounds. 2. League Park was a major league ballpark from 1891 to 1946. 3. League Park still host’s amateur baseball matches to this day, but hasn’t hosted a major league match since 1946. 4. The existing buildings on the League Park site date to 1910. 5. The League Park field (although now fully grass) is in the same spot as in 1891. 6. League Park is in the United States. Ball grounds are defined as “fields” where the game of baseball has been played and/or continues to be played. Ballparks are defined as structures that are around the field, in full, or in part, whose sole purpose is to support the ball grounds for the objective of playing the game of baseball. If we purely use a ball grounds definition, the oldest ball grounds in the country is Elysian Fields, Hoboken, NJ, where the Knickerbocker Base Ball Club played beginning in 1845. However, the park no longer exists, and the goal of this article is to find the historical significance of existing ball grounds or ballparks. Therefore, the oldest existing ball grounds, is most likely Clinton, MA’s Fuller Field. The game of baseball has been played on this field since 1878, continuously, to this day. Even Guinness Book of Records recognizes Fuller Field as the oldest ball grounds in the world. However, there is a dispute to that record. Labatt Park (formerly Techumseh Park) in London, Ontario, Canada claims to be the oldest continuously operating ball grounds in the world. However, the arrangement of the field has changed (i.e., home plate and the base alignment) since it was opened in 1877. Therefore, Guinness Book of World Records defines "continuous" as: operating ball ground is a field on which baseball is played, that has not changed since its inception. There is still more controversy to this subject. The Hartford Base Ball Grounds, Hartford, CT, was established in 1874 for the National Association of Professional Base Ball Players Club, the Hartford Dark Blues. Currently, the field still exists, and is on the grounds of the Metropolitan Community Church. It is also currently the home ball grounds of a vintage baseball club named the Hartford Dark Blues, and called Colt Meadows. 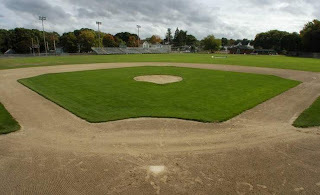 It hasn’t continuously been used as a ball grounds, but it is currently, on the same spot as the original ball grounds. Therefore, Colt Meadows (aka Hartford base Ball Grounds) is the oldest ball grounds where the game is still being played, but it can't claim the title of "continuous play". The matter is further complicated when you designate “professional” v. “amateur” ball grounds. You can further break this down to “major league” professional clubs v. “minor league” professional clubs. Major League Baseball and the Baseball Hall of Fame both recognize the following leagues as “major leagues”: The National League (1876-present), Union Association (1884), American Association (1882-1891), Players League (1890), American League (1901-present) and the Federal League (1914-1915). At no time did any “major league” clubs play on Fuller, Labatt or Hartford baseball grounds. The Hartford Dark Blues, who played for the National Association of Professional Base Ball Players (1871-1875), is not considered a “major league” team by MLB or BHoF. However, they were a professional club, and did play in the National League for one season (1876), on the Hartford Ball Grounds. Prior to 1910, most ballparks were made with inexpensive materials (wood). Most of these parks were used heavily, for baseball in the summer, and many, like Cleveland's Kennard Street Park (Carnegie & E.46th) (1879-1884), were used as ice skating parks in the winter to supplement income. Also, most wooden parks seated a smaller number of fans. Steel and brick ballparks allowed greater capacity due to higher, stronger structures. The extensive use of ballparks, combined with the common occurrence of lightning strikes and the progress of the game made all wooden ballparks for major league professional use obsolete by the mid-20th century. In addition, the land encroachment of large cities, which could support a professional baseball franchise, led to many of the wooden parks being sold for development. 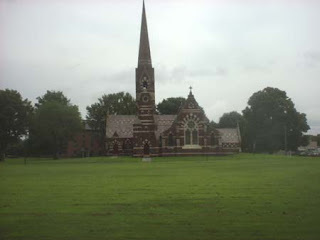 Note that most of the “oldest” parks or ground categories exist in small towns or cities. Consequently, all original wooden ballparks from the 19th century and early 20th century have been destroyed, and no longer exist. 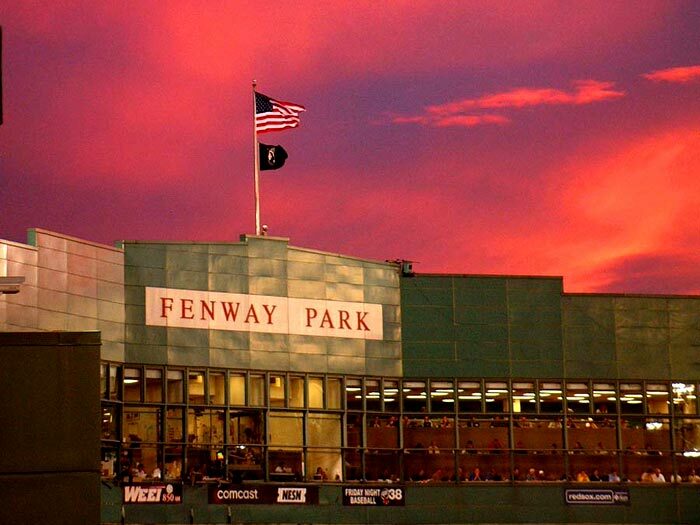 There is some controversy surrounding which ballpark is the oldest. 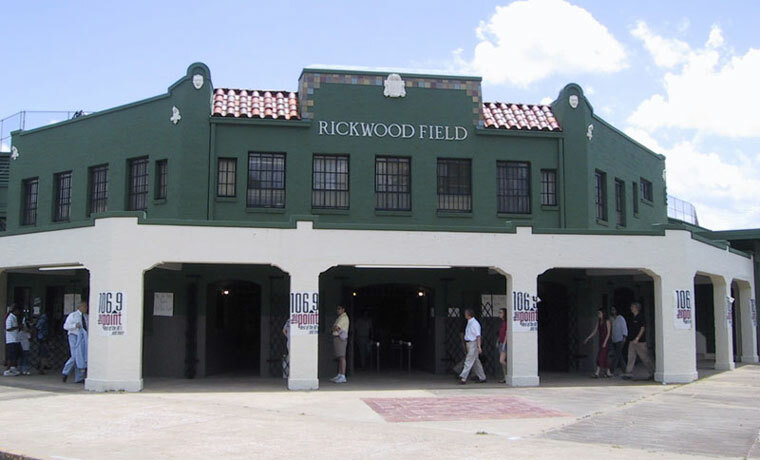 Rickwood Field, Birmingham, AL, built in 1910, claims to be the oldest continually operating ballpark in the world. According to projectballpark.org, Rickwood’s status may be in question. Cardine’s Field in Newport, R.I., was allegedly host to baseball matches as early as 1893. The backstop at the park is dated to 1908 and the structure of the stadium was rebuilt in 1938. Centennial Field in Burlington, Vermont was originally built in 1906. It was destroyed by fire and rebuilt as a concrete and steel structure in 1913. Wahconah Park in Pittsfield, MA has hosted baseball matches since 1892. Although it is a wooden ballpark, it was constructed in 1919, and renovated in 1950. 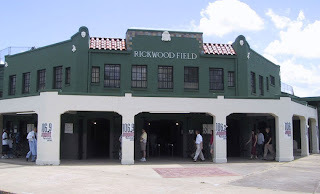 Because Rickwood had a structure built in 1910, which has remained and not been renovated or destroyed and replaced, it has to be the oldest continuously operating ballpark in the world. The other candidates could try to fall into the category of oldest ball grounds, due to lack of structures when they opened, but they fall short in those categories as well. Cleveland’s League Park is by far the oldest base ball grounds of a major league club that still exists. The field is in the same location as it was in 1891. Even http://www.projectballpark.org/ sites it is probably the oldest professional major league ballpark. The only field that comes close is the old Hartford Ball Grounds (Colt Meadows). The issue with Colt Meadows is that it still is an open field, and the locations of home plate and bases may not be the same as they were in 1876 (the only year a major league club played on the grounds). Because the location of the initial field is in dispute, Colt Meadows needs to have a category all it’s own, and rightfully owns a claim as one of the worlds oldest ball grounds. There is no controversy as to which ballpark is the oldest major league ballpark that still exists, and where the game is still played. That title goes to Cleveland’s League Park. No other former major league park built prior to Fenway Park exists today. League Park’s remaining buildings were built in 1910, and the field hasn’t changed since 1891. Both dates predate Fenway Park, Wrigley Field or any other parks that existed during that time period. Cleveland’s League Park is an exception to many of the rules that led to the decline of professional parks and grounds. 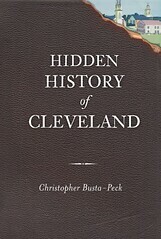 Because of Cleveland’s early growth as a large city, it was able to afford to field a major league club early in the base ball craze of the mid 19th century. 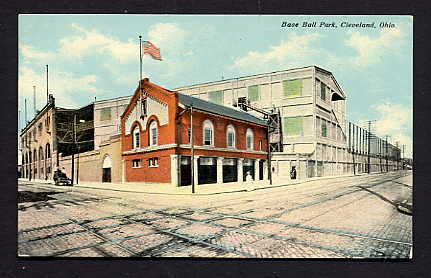 In addition, when wooden parks began to decline, Cleveland was fortunate enough to build a modern facility on the old ball grounds. Finally, after the majority of the park was razed in the 1950’s, it was not developed, mainly due to urban decline. Therefore, League Park still exists today as one of the oldest ball grounds/ballparks in the world. The question is, what do we do with this treasure? Can Cleveland maintain and save what is left, or does it fall into decay, development and destruction like all of her predecessors.